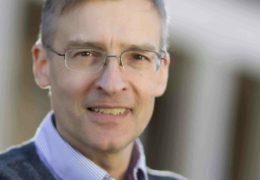 Henrik Dohlman discovered why seemingly identical cells might react differently to the drugs we use to battle diseases. Talk to Henrik Dohlman, and you’ll realize that the quest for personalized medicine is about to get a whole lot more personal. We all know that people are very different, but Dohlman is finding evidence that cells we once considered identical are far from it. They respond differently to stimuli like odor, light, and—perhaps most importantly—therapeutics such as cancer drugs. Dohlman, a professor of biochemistry and biophysics in the UNC School of Medicine, is like a mechanic for cells. He can tell you which part is like a gas pedal—a protein that pushes a brain chemical into action, for instance. And he can tell you which part is like the brakes—a protein that counteracts the effect of the gas pedal. Now he’s even able to show us why these brakes don’t work the same way in cells that are genetically identical. Dohlman, a member of the UNC Lineberger Comprehensive Cancer Center, studies yeast—single-cell organisms that are much more similar to each other than, say, individual human-heart cells. They can live in a much more controlled environment. They’re also easier to manipulate. All of these things make them a good experimental model for studying the tiny proteins that cells use to do their thing. When a cell divides to make two new, identical cells, they have exactly the same DNA and live in exactly the same environment. You’d think that a chemical, such as a drug, would affect these cells in the same way. But sometimes it doesn’t. Somehow, the genes of two seemingly identical cells produce different amounts of proteins. In humans, this could mean that even genetically identical cells might respond to a drug, such as a cancer drug, in different ways. Or, cells in a foreign invader, such as a bacterial infection, might respond to an antibiotic in unexpected ways. Think of it like this: 100 tumor cells are genetically identical, and 99 might express enzymes at exactly the same level, but one cell might produce an enzyme at a much higher level, which allows it to resist chemotherapy, thus shielding itself from the medicine. The biochemical difference between that one cell and the other 99 is what Dohlman calls biochemical noise. This kind of noise—or cell-to-cell variability—exists in bacterial cells, in yeast cells, and in our cells. The noise is one reason why some of our cells don’t react to drugs or even our bodies’ natural chemicals the way we might expect or want. “Because that’s just what happens in biology,” Dohlman says. We’re not machines. Still, Dohlman is finding clues to help unravel this biology so that future therapeutics might work better. In the 1990s, Dohlman found that RGS proteins help regulate a cell’s complicated signaling process. Signaling is how cells communicate when faced with outside stimuli. The signaling cascade basically works like this: on a cell’s surface, there’s a protein that receives a signal from outside the cell. This receptor protein then calls upon a G protein, which then tells an enzyme to make a small chemical that activates a series of events leading to gene expression. And this allows the cell to respond to the outside stimuli. Odors work on these G protein receptors. “So does light, taste, most neurotransmitters, most hormones, and about half of all drugs,” Dohlman says. 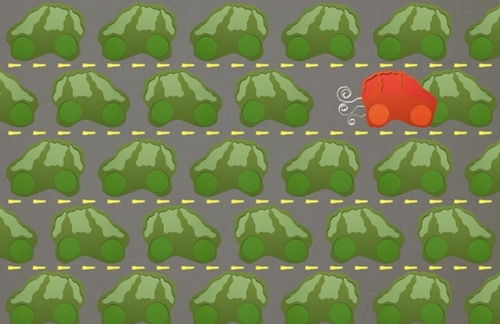 If these G proteins are like the gas pedal causing the cell to drive into action, then RGS proteins are the brakes. And these brakes, Dohlman found, are necessary to make sure the cell doesn’t drive off a cliff. Together with Gauri Dixit, a graduate student in the Dohlman lab during this research, Dohlman conducted experiments to show how mutating an RGS gene releases the brakes of a pheromone—a chemical signal that triggers cellular attraction. In yeast, it’s a mating pheromone. Now, for the first time, Dohlman’s lab has shown that mutating the RGS Sst2 gene causes the yeast cells to respond to the pheromone signal in dramatically different ways. The variability of these responses is the biochemical noise. That is, RGS proteins not only serve as the cell’s brakes, but also control how consistently those brakes work. Moreover, Dohlman’s team found that Sst2 regulates both of these processes through different pathways. When his team disrupted the way the RGS protein was supposed to function, they found that the yeast cells could still respond to chemical signals but with much greater variability from cell to cell. That is, he could slam on the brakes of the car without affecting how much the car spun out of control. “This was a shock,” Dohlman says. “This tells us that the signal and the noise don’t always go together in a biological system.” It also means that when developing a drug, pharmacologists might have to measure the effect it has on biochemical noise. Dohlman’s experimental methods, laid out in his paper published in Molecular Cell, now allow drug developers to do so. Also, his findings could lead to a new target for better therapeutics. Here’s a real-life example: a person who is depressed might benefit from a type of medication called a serotonin selective reuptake inhibitor, or SSRI. “These drugs block the uptake of serotonin from a nerve synapse so that the little bit of serotonin the brain does produce lasts longer,” Dohlman says. “The reuptake system is suppressing the nerve cell’s response to serotonin. Well, the RGS protein we study is another signal suppressor. It’s not a drug target, yet. We believe it could be an alternative for people with depression. This is why Dohlman conducts experiments in yeast—to demystify the complex communication cascades that cells use to survive and function properly. To add another level to all of this, Dohlman thinks that the older the cell, the “wiser” it might get. He’s now studying this. Over time, this biochemical noise adds up, which, Dohlman says, could be one reason why there’s so much variability in health among 90-year-olds and much less among 90-day-old babies. This could be one way that cellular age and biochemical noise play roles in diseases, such as cancer. And that, ultimately, is why Dohlman is studying these tiny, obscure regulator proteins. And if that’s not reason enough to study the intricacies of signals and cellular variability, then nothing is. 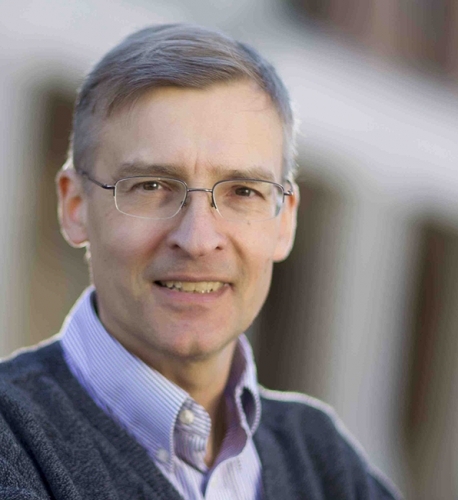 Henrik Dohlman, a professor and vice chair of the department of biochemistry and biophysics, has a joint appointment in pharmacology, also in the UNC School of Medicine, and is a member of the UNC Lineberger Comprehensive Cancer Center. He’s the senior author of the paper published this June in the journal Molecular Cell. The first author is Gauri Dixit, who conducted this research as a graduate student in Dohlman’s lab.